…sometimes isn’t such a good idea after all. I played a NL HE Heads Up match at Absolute Poker in preparation for tomorrow’s HUC3 match and I didn’t do all that good. Note to self: try to take your time and don’t let yourself be bullied around tomorrow. Trust your gut. As I’m in the midst of what I like to call “extreme exam preparation” (the last 1-2weeks leading up to a major uni exam) there’s not much going on at the poker front as I’m just too knackered to really focus on the game, which isn’t a good thing if you’re trying your “luck” at a new (higher) level. So no poker played on saturday and little today (sunday). After sticking my nose into uni stuff (mostly web-based integration and architecture of application systems) all day I didn’t feel the urge to really play, but playing a little poker won’t hurt to get your thoughts of the stuff, so what the hell. Donked around at AbsolutePoker for a little, playing a low limit NL HE MTT…which was a quick one despite holding AA early on (which held up on a scary board) and KK which was busted by pocket sixes to cripple me…the end was rather entertaining too…AQo vs KQs vs KQo…sure enough the two outer King hit…after that I donked off some dough at the cash tables when my pocket kings were crushed again, the hiltons held up though so only down a half buyin for the night…at least something. Nothing exciting in MTT play either…Limit just isn’t my game (anymore).Â� At least I finished the session on a high note…in preparation for DADIII – The HU Championship – I played a HU match on Absolute Poker and totally owned my opponent. I’m so looking forward to play DADIII! Oooh what a day. Played an even wider mix of games today in order to, hopefully, get my bankroll (which was micro to begin with) at AbsolutePoker back from life-support. 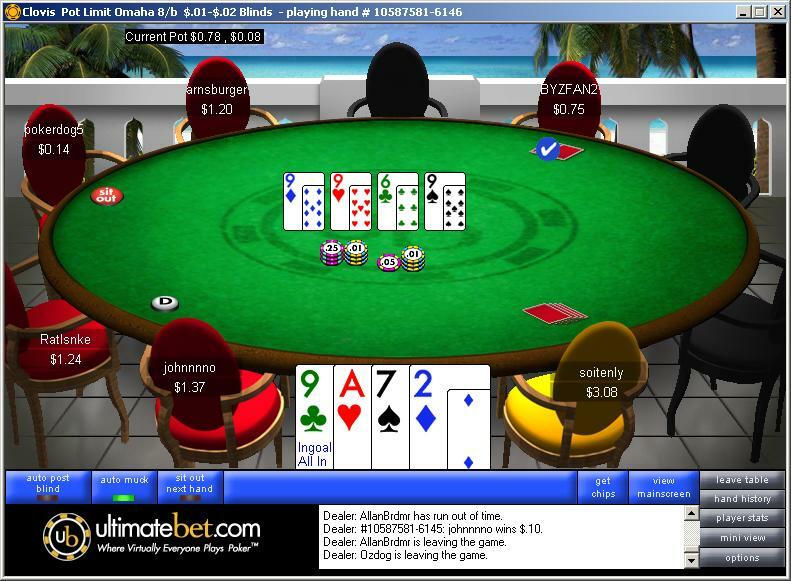 I played in various HE games ranging from fixed limit 0.10$/0.20$ to 0.10$ NL along with the usual session of Omaha H/L. I couldn’t get much going and so I decided that it would be a good idea to play some S&Gs. Good idea. I won the Omaha H/L one, bubbled in a HE NL and finished outside the money in the other one. Nontheless some solid playing time without risking too much. I guess going with multiple S&Gs Omaha 8b is the way to go if I want to rescue the remaining few dollars there. But enough reporting/ranting…I’m going to watch the final table of the “Battleship at Atlantis” Heads Up tourney now…should be interesting! Side Note: the main event of the PCA is a done deal, check out Brad’s (Otis’) coverage here if you haven’t already. Spoiler: 22 year old student and PokerStars regular Steve Paul-Ambrose has won the thing…1.363.100$ + the WPT championship seat (25k$) not a bad pay-day for a student(! ), ka-ching! Played some orbits at UltimateBet at the penny PL tables and I rocked…totally back in business now and almost up to double my original deposit. Groovy. This time I said to myself: “Don’t fear the bubble! Play as you usually would” – so I did and it came back to bite me as I ran into the chipleaders A-A-2-K with my A-K-3-4…to bad so I’m out in fourth place (3 in the money), but not feeling all too bad about it. At least I played aggressively on the bubble and with one other card on the board it would have payed off. 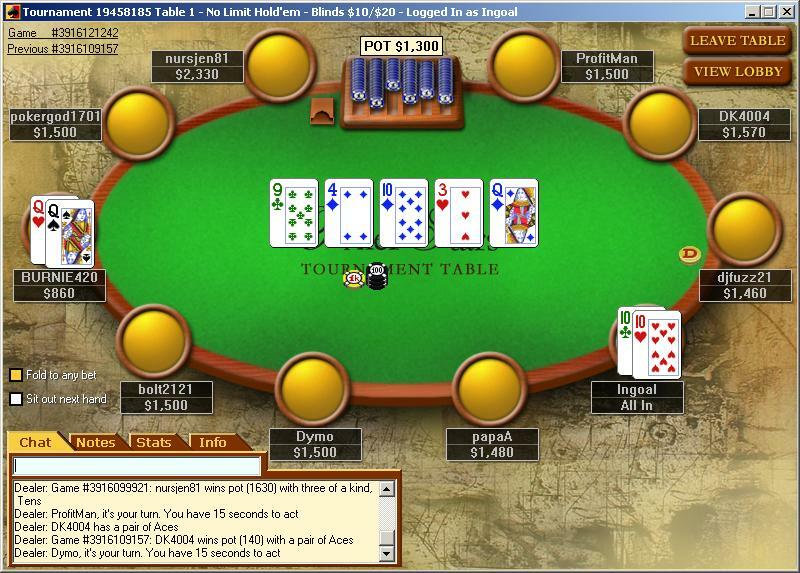 So I sat down at a Pot Limit 0.10$ Omaha H/L table over at Absolute Poker which was fairly crowded. One thing was obvious: one player, let’s call him Mr. Bully, was raising every pot preflop. So the first chance I got with a decent hand I was in the middle of it…sure enough he caught his donkey runner runner flush draw and my first Buy-In was history.